Bride to be Lisa, spent a fortune picking out the most impressive wedding invitations. She spent a great deal of time getting the wording correct. Lisa even went as far as sealing the envelope with a wax sealer, just for that finishing touch. Her and her husband to be's wedding invites have been posted, but a few weeks has elapsed and they only have received 6 of the day invites, out of a total of 80 guests who you invited. It is actually quite remarkable how often the above scenario happens. Each day on Facebook book we regular see couples complaining that their guests haven't RSVP'ed to their wedding. See for yourself - search any Facebook wedding group for "rsvp" and you will see the frustration flowing from your screen! So clearly there is a problem which needs a solution. So what is the problem with traditional RSVPs? Why don't the majority of guests who are sent traditional paper invites reply? The answer lies in the question in one word - 'traditional'. The tradition of sending RSVPs via snail mail goes back to the black and white days. But we now live in an era where people demand convenience in their daily lives. Your guests are normal people too remember, and have limited time. Filling in a paper RSVP, popping it into an envelope (whether you provided one or not) and going to the local postbox seems like a simple task - but not anymore. People DEMAND convenience and those couples who are embracing wedding websites with online RSVP are seeing a huge percentage of couples reply to confirm their wedding attendance. 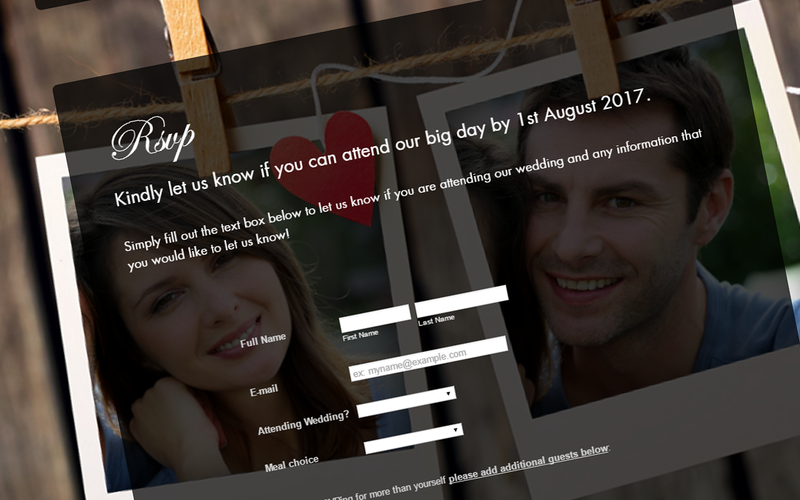 Laura Higgins, Marketing Manager for OurBigDayInfo Wedding Sites, says, "We've seen couples reach 98% for RSVP replies". "One couple who had a large wedding of 300, successfully received 280 of their RSVPs online". Collecting RSVPs online provides more convenience to your guests when compared to traditional paper RSVPs. So why do most guest's prefer to RSVP online? "It's pretty simple", adds Laura. "Our couple's wedding sites are available on people's mobile phones, computers and tablets, so there is a huge convenience in just clicking one button to send their Wedding RSVP. It saves jumping into the car and having to locate a postbox. I know that sounds lame, however people have less time these days, and if you provide them convenience - they will use it!". Laura adds, "Lots of couples out there only realise the frustration with paper RSVPs when the horse has bolted and they've committed to paper invites - but at this stage it is too late, and then the frustration sets in". "Those couples who have embraced online RSVPs with ourselves don't stop praising us for this service - they love it!". "They even love our RSVP email alerts - basically they receive an email alert each time a guest sends their RSVP via their wedding website". So does this mean that paper invites are dead? Not really. Some couples love the concept of paper invites as they are a great way of announcing their big day - but use them encourage their guest's to RSVP online. This is usually just a one liner at bottom of the invite which reads "RSVP online at our wedding website" or "Visit Our Wedding Site To RSVP". For those couples who have realised the power of online RSVPing, they are sure to have less frustration in getting a head count of their wedding guests for their big day. For those who haven't realised the power of online RSVPs, experience it for yourself and setup your wedding website using the simple form below. You (and your guests) will be glad you did.